This is Part 2. If you have not cmoppelted Part 1 go back and completed it. 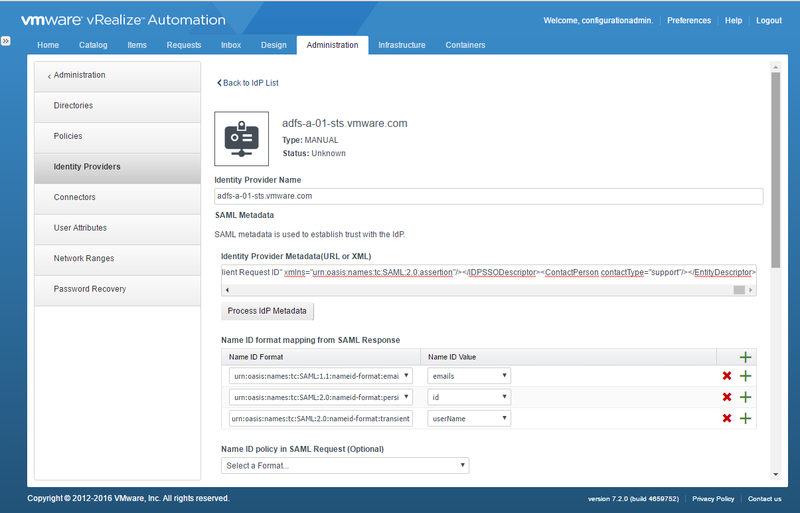 As part of SAML configuration to support ADFS integration with vRealize Automation and ServiceNow, you must configure ADFS integration with vRealize Automation. This section covers how to configure ADFS Integration with vRealize Automation. 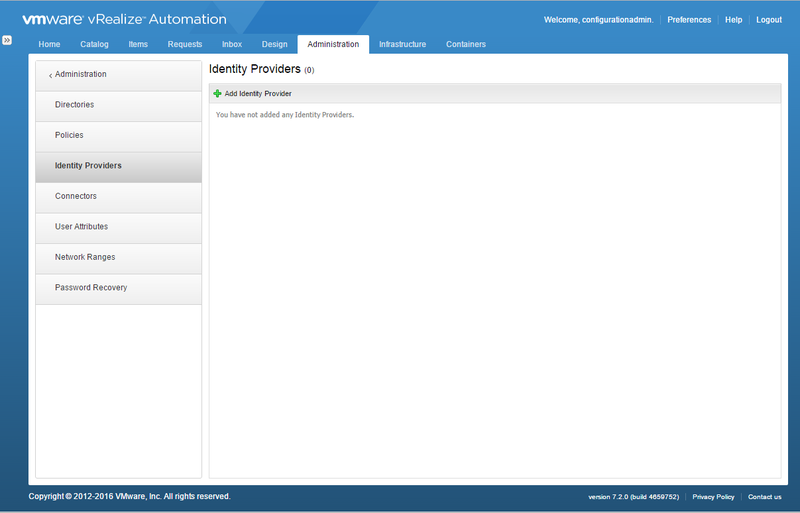 This section covers how to create an Identity Provider in vRealize Automation . 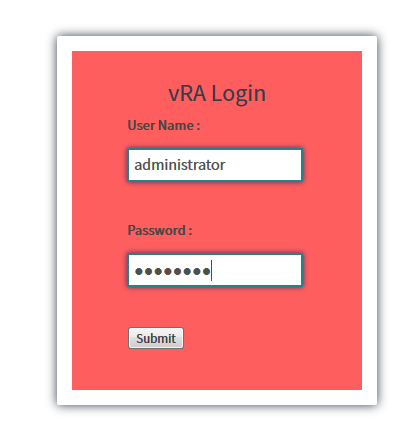 Log in as a tenant administrator in vRA. 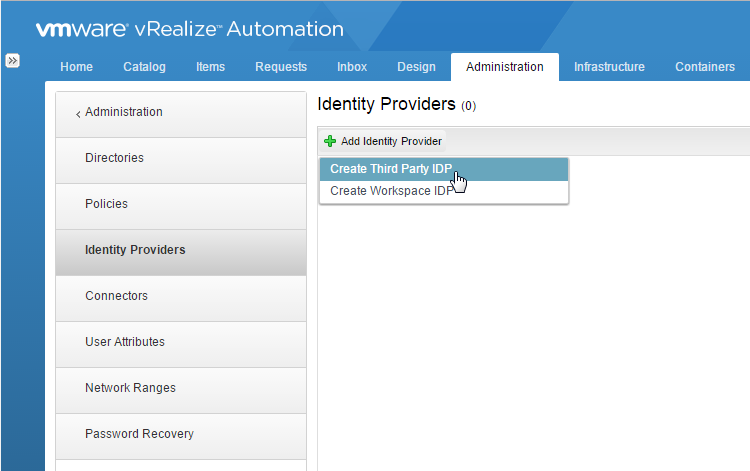 Select Add Identity Provider and then Create Third Party IDP. Select urn:oasis:names:tc:SAML:2.0:ac:classes:Password from the Authentication Methods drop down menu. 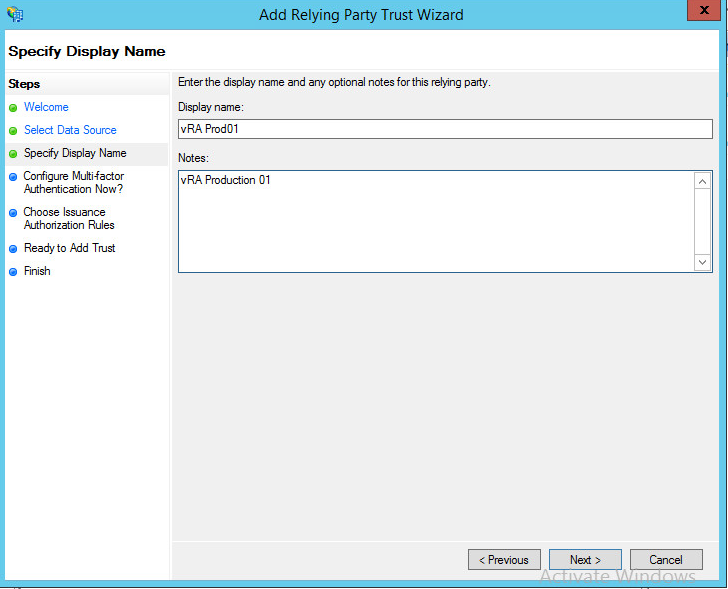 You can set up an ADFS relying party trust with vRealize Automation. A relying party trust object uses identifiers, names, and rules to identify a web application to the Federation Service. 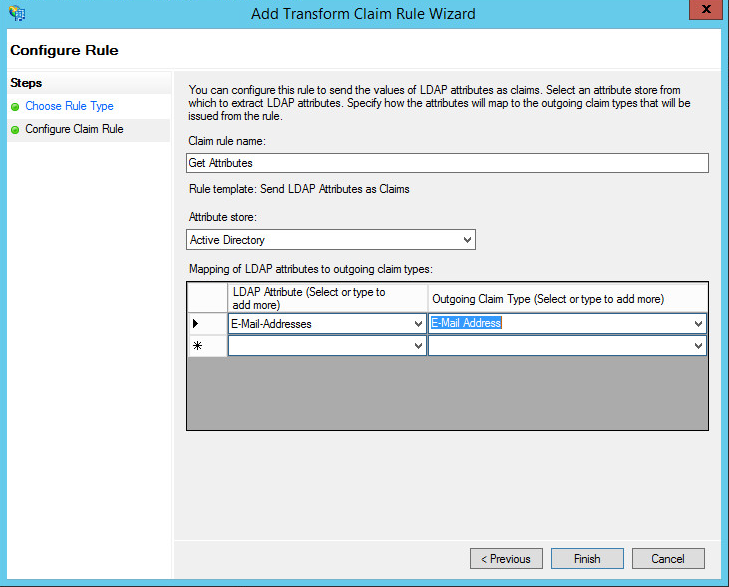 You must set up an ADFS relying party trust and the appropriate claims rules. 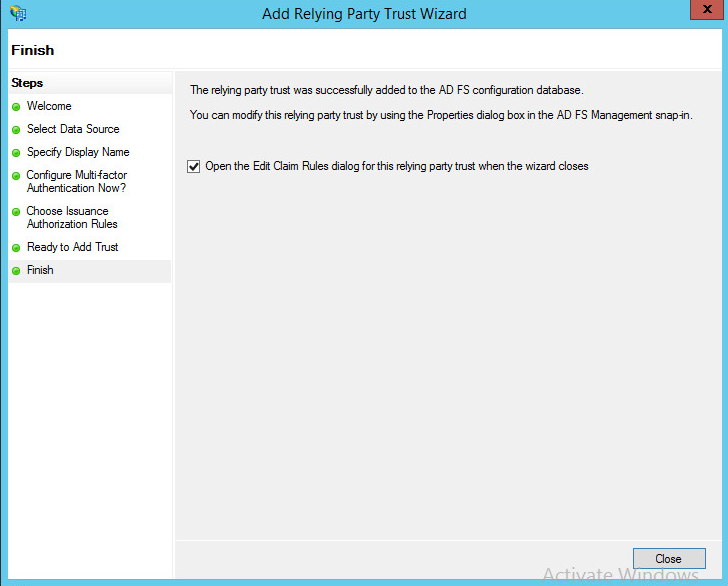 This section covers how to configure an ADFS Relying Trust with vRealize Automation . Import the vRealize Automation Service Provider metadata file, sp.xml, that you copied and saved previously when setting up the Identity Provider. Enter a name for your vRealize Automation appliance instance in the Display text box on the Specify Display Name page. You can also enter a description for the trust in the Notes text box. 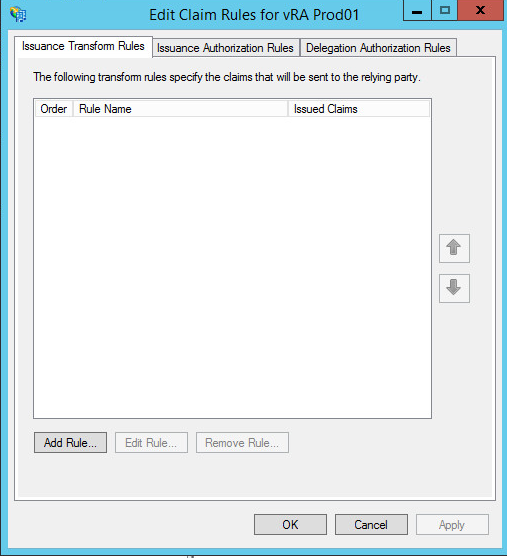 When configuring ADFS integration with vRealize Automation, you must set up the appropriate claim rules to control the behavior of incoming and outgoing claims. 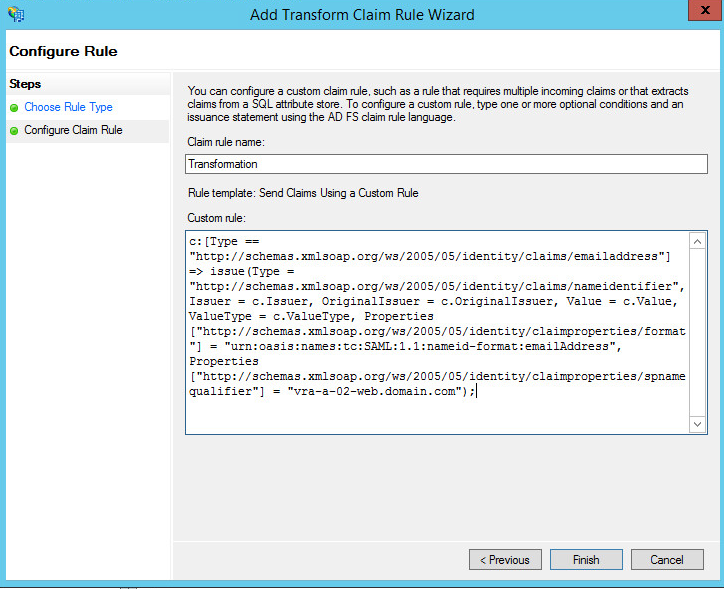 This section covers how to configure Claim Rules for vRealize Automation ADFS integration. 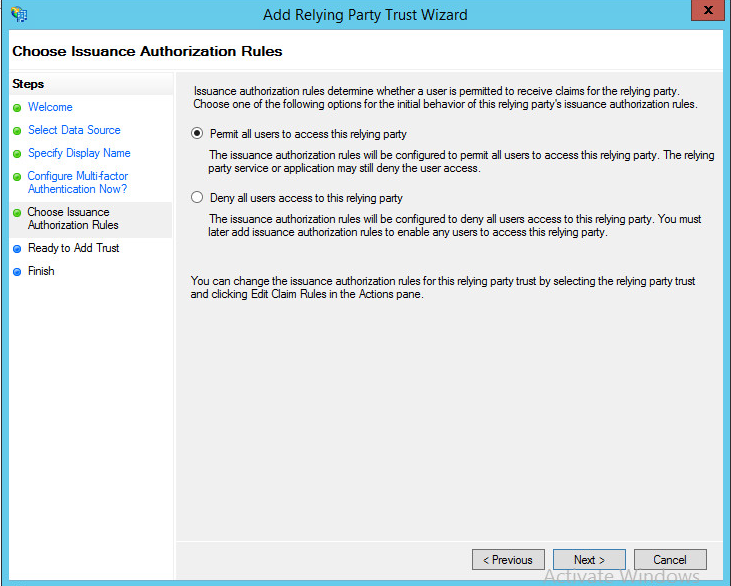 Right click the relying party trust that you created for vRealize Automation, and select Edit Claims Rules. 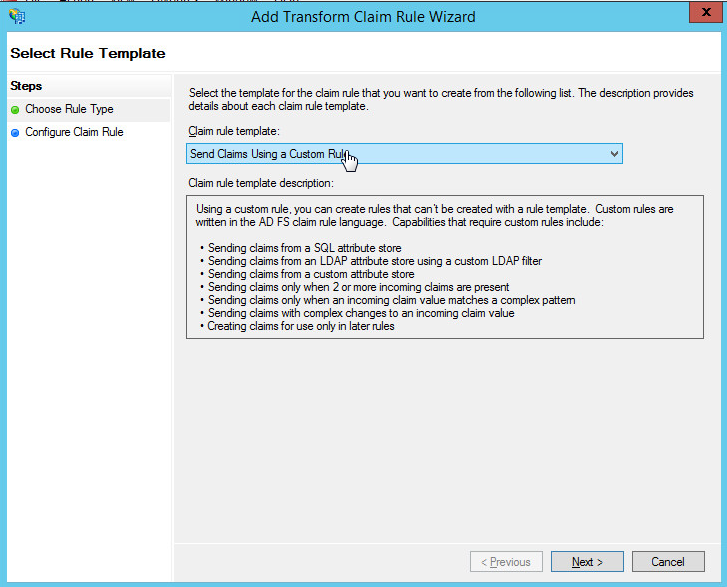 Enter the name Get Attributes in the Claim rule name text box on the Configure Claim Rule wizard page. 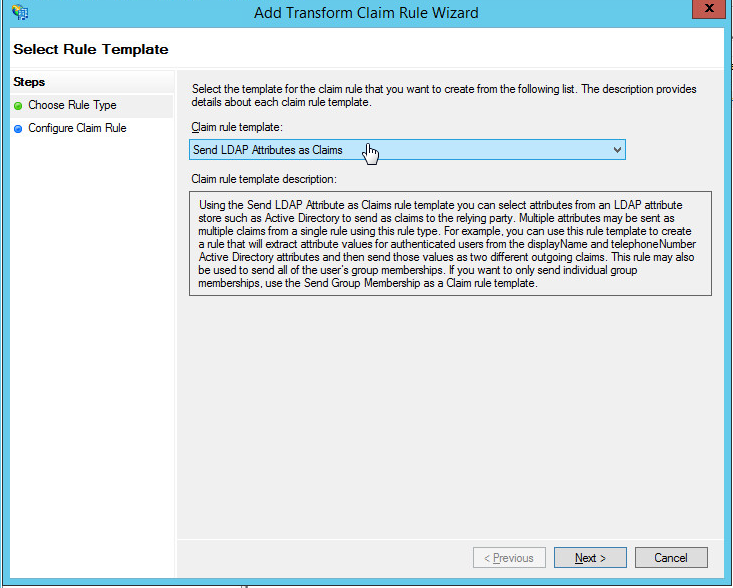 You must add a rule that transforms the attributes received from LDAP in the Get Attributes rule into the desired SAML format. Paste the following text into the rule. Change vmwareidentity.domain.com in the last line of the pasted text to your vRealize Automation appliance fully qualified domain name. 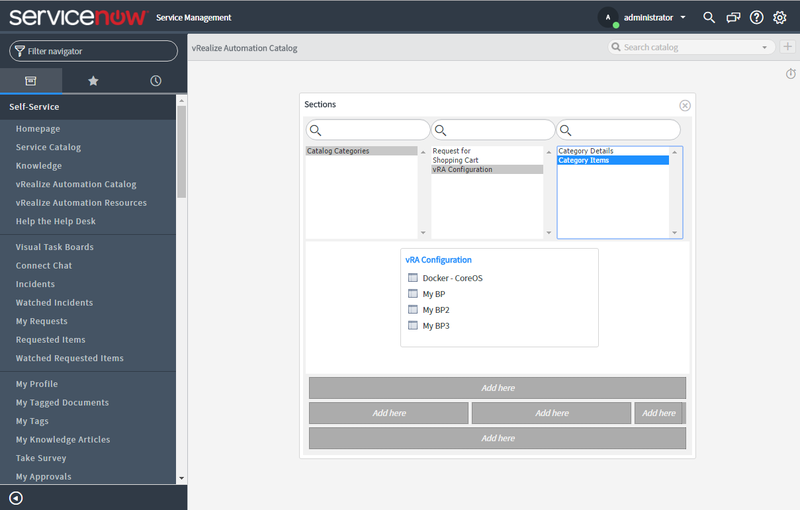 The vRealize Automation plug-in for ServiceNow enables ServiceNow users to deploy virtual machines and perform day 2 actions on resources using vRealize Automation catalog and governance capabilities. 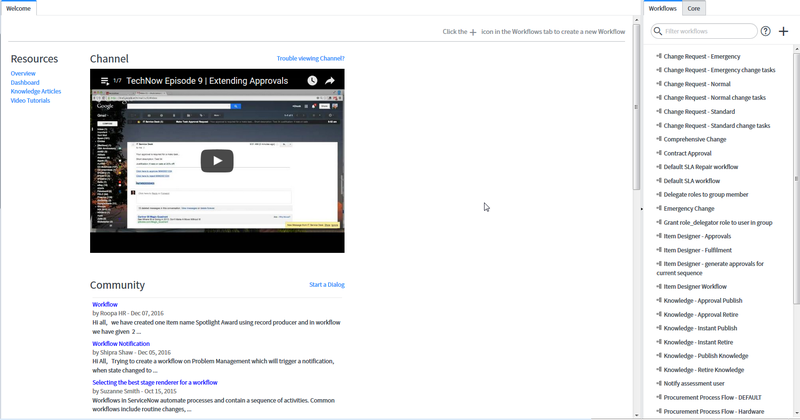 This section covers how to install the vRealize Automation Plug-in for ServiceNow. Select System Update Sets > Retrieved Update Sets. Select Import Update Set from XML from the displayed menu. 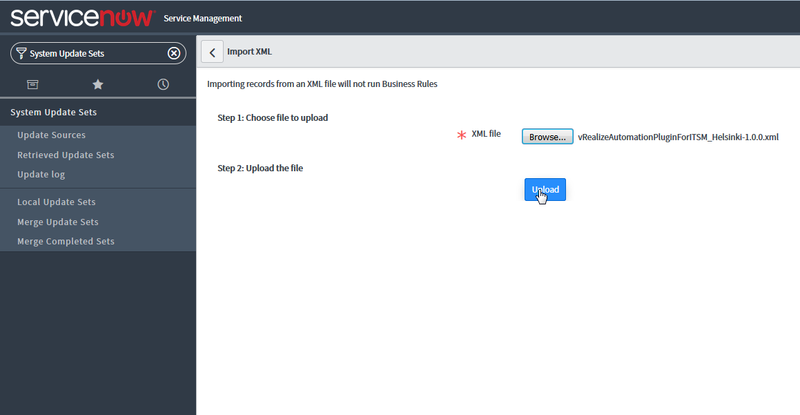 Click the Browse button on the dialog to choose the file to upload, and then select the vRealize Automation ServiceNow XML file. A dialog box will appear when the update set has been validated. 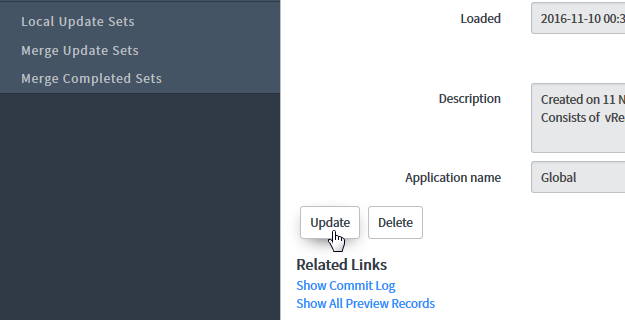 A dialog box opens automatically after you click Commit Update Set while the commit action is in progress. A Close button appears on the dialog when the commit completes, and you can click this button to dismiss the dialog. 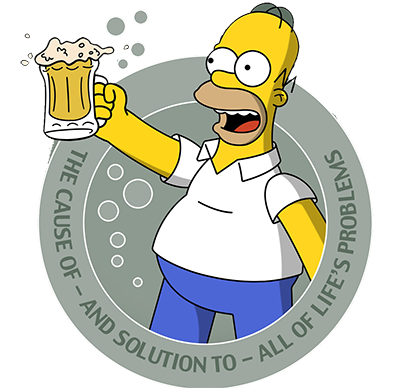 After you install the vRealize Automation plug-in for ServiceNow, you must configure users. The ADFS configuration relies on the email address of users to be the same in vRealize Automation andSNOW for single sign on through ADFS. We recommend setting up your users in both systems. Currently ADFS impacts all users in vRealize Automation and ServiceNow. 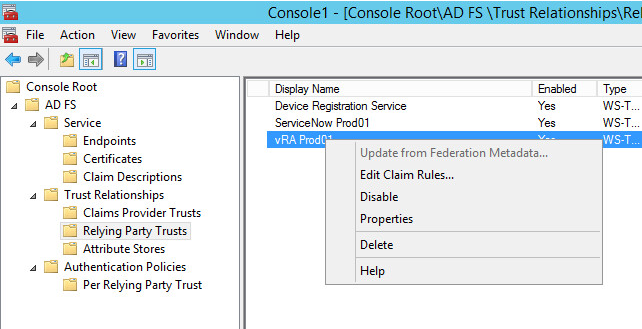 ADFS allows login for vRealize Automation users that are not in ServiceNow. However, it does not allow login for ServiceNow users that are not in vRealize Automation. Verify and update if necessary the appropriate users and roles in ServiceNow. See http://wiki.servicenow.com/index.php?title=Creating_Users_and_Associating_to_a_Group#gsc.tab=0 and http://wiki.servicenow.com/index.php?title=Creating_Roles#gsc.tab=0 for more information about working with users groups, and roles in ServiceNow. 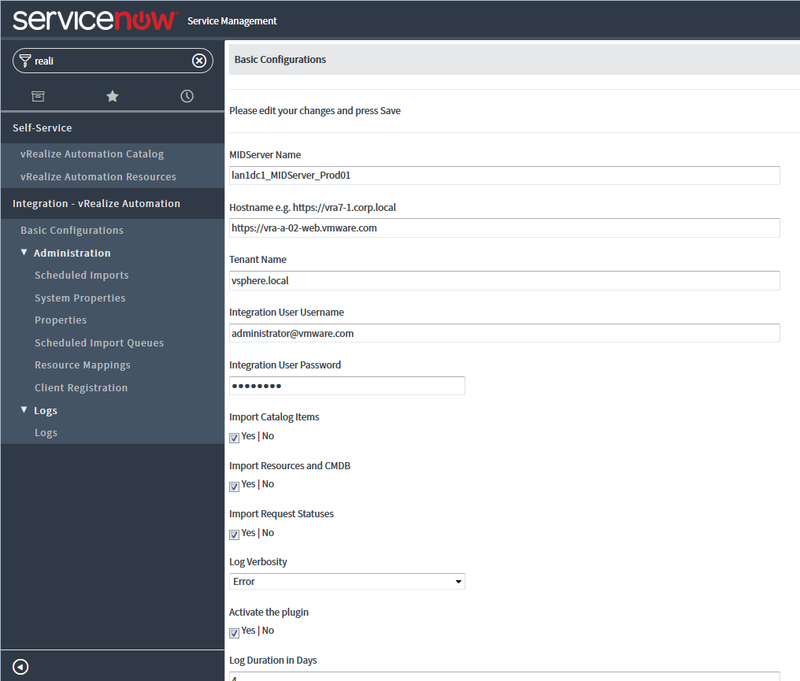 These ServiceNow users must map to appropriate users in your vRealize Automation Active Directory store for the specified tenant. For each configured user that will request machines from the catalog, you must configure the email address and apply the password in the Users System Administration in ServiceNow. Note: Users with the ServiceNow roles described in the preceding table need to map to users with similar roles in vRealize Automation. For instance, most End Users would map to the Basic User role within a business group. In addition, the End User could also map to the Support or Business Group manager roles within a business group. Itil Users can also map to Basic User, Support, or Business Group Manager roles. Itil Users may be more likely to be a support or Business Group Manager. 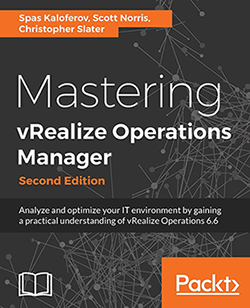 System Admin, Catalog Admin, and Approval Manager activities do not require a mapping to a specific role in vRealize Automation. However, we do recommend that the user exists in vRealize Automation for single sign on purposes using ADFS. You could, for example, have a SNOW system admin with any role in vRealize Automation or admin roles. To set up the ServiceNow users, add the roles specified in the preceding table. Verify that the email address is the same as the user set up in vRealize Automation for single sign on through ADFS. 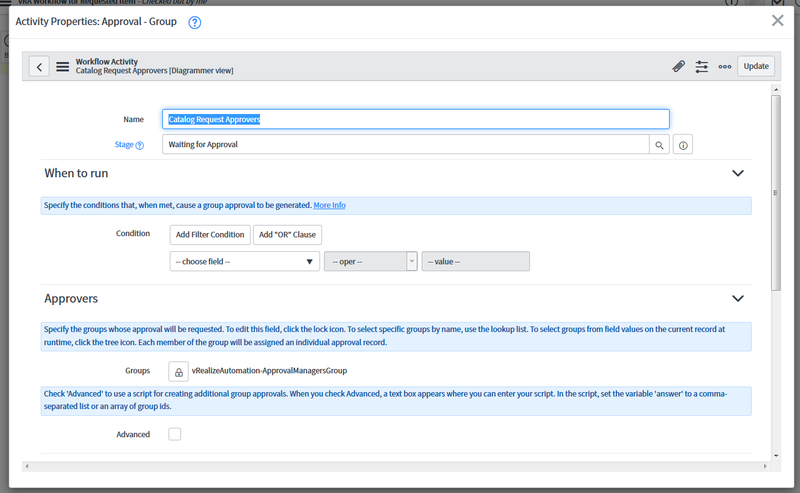 Assign the approval group that contains your ApprovalMgr to the vRealize Automation workflow for approvals to be accepted upon machine requests. The system admin should configure the vRealize Automation workflow for the requested item. You can access the workflow from the workflow editor. The workflow is configurable. At a minimum, you must change the approval group to the group you want to receive approvals. When users request vRealize Automation catalog items, this workflow will be run, and approvals will be sent to this group before the request is submitted to vRealize Automation. The Catalog Admin must choose whether to display categories within vRealize Automation Catalog menu item, or within Service Catalog alongside whatever else they use. 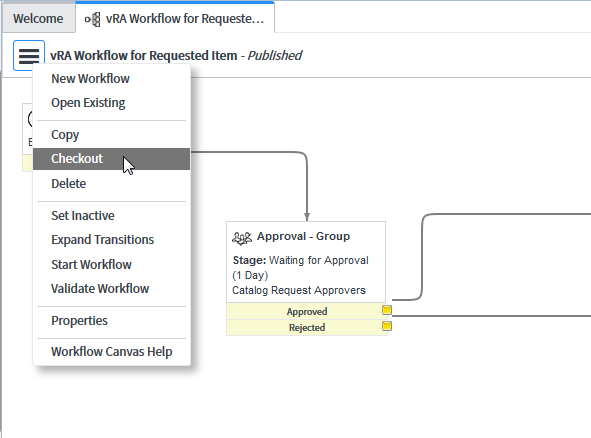 This section covers how to configure the vRealize Automation Workflow for Requested Items. 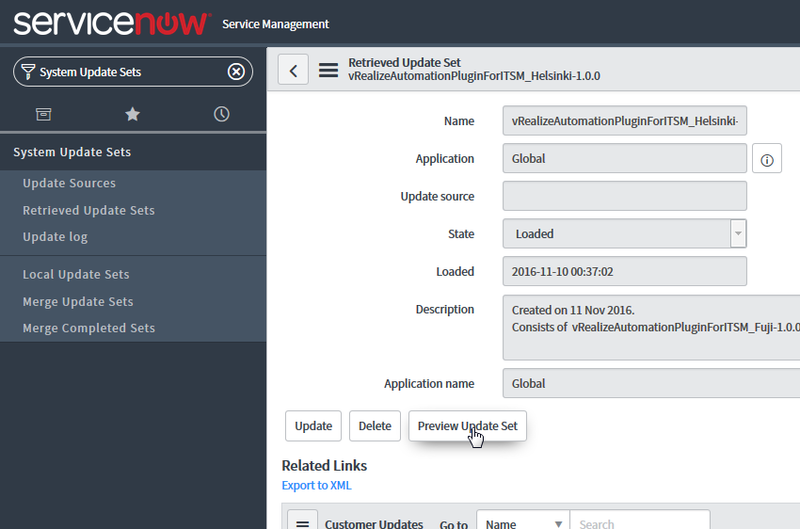 After you install the vRealize Automation plug-in for ServiceNow, you must configure users and basic settings. The ADFS configuration relies on the email address of users to be the same in vRealize Automation and ServiceNow for single sign on through ADFS. 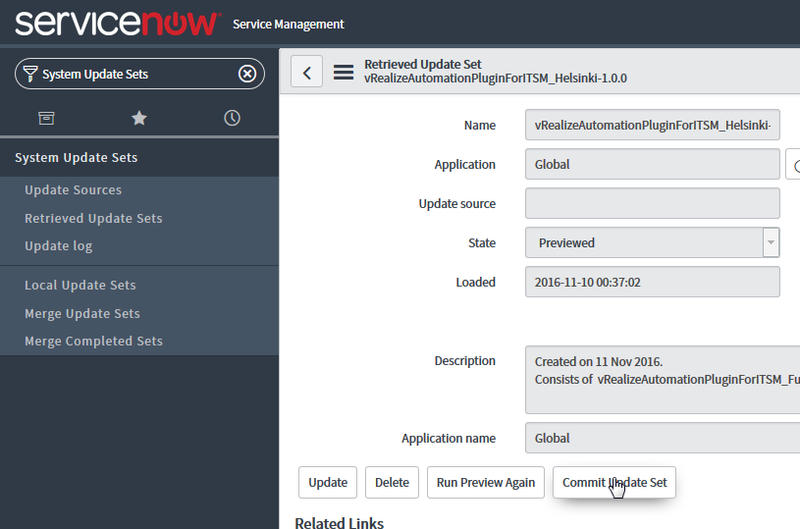 This section covers how to configure the vRealize Automation Plug-In for ServiceNow. 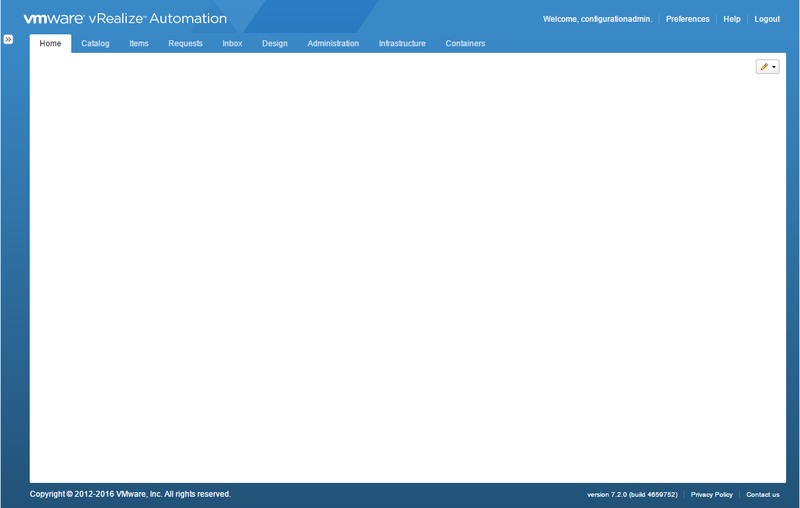 Select Integration – vRealize Automation > Basic Configurations. Enter the appropriate settings for your vRealize Automation tenant, URL, and plugin. The name of the MIDServer you created for use with vRealize Automation. 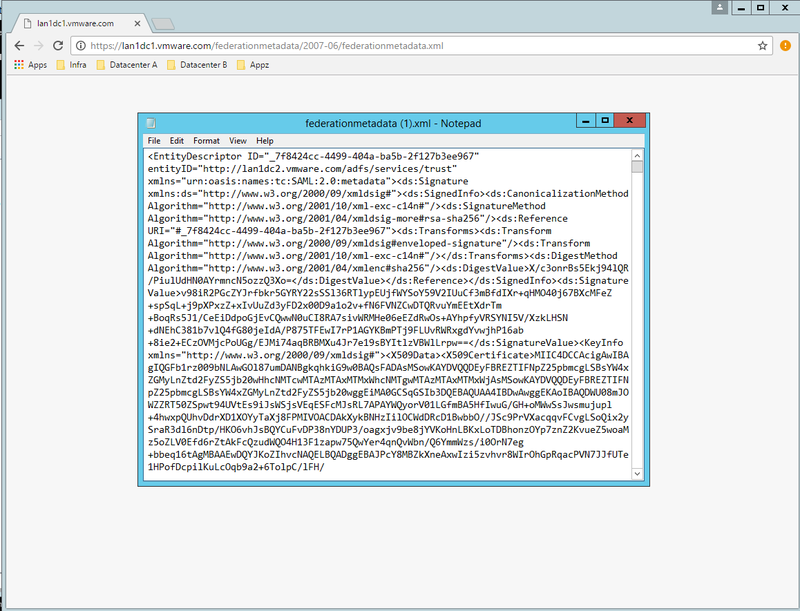 URL address for the vRealize Automation appliance. The integration user name. 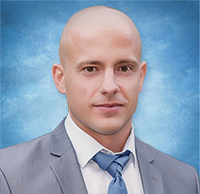 The integration user must be a business group manager in all business groups. The integration user does not require a role in ServiceNow. Select Yes to import the vRealize Automation catalog. Select Yes to import Request Statuses from Items. Defines the error logging level. Levels are info, error, debug, and warning. Email address to use for error reports. 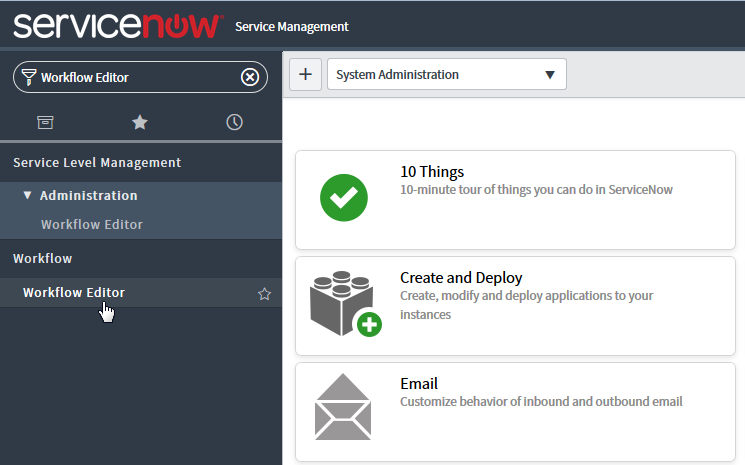 After installing the vRealize Automation plug-in for ServiceNow, you must register it for single sign-on within ServiceNow. 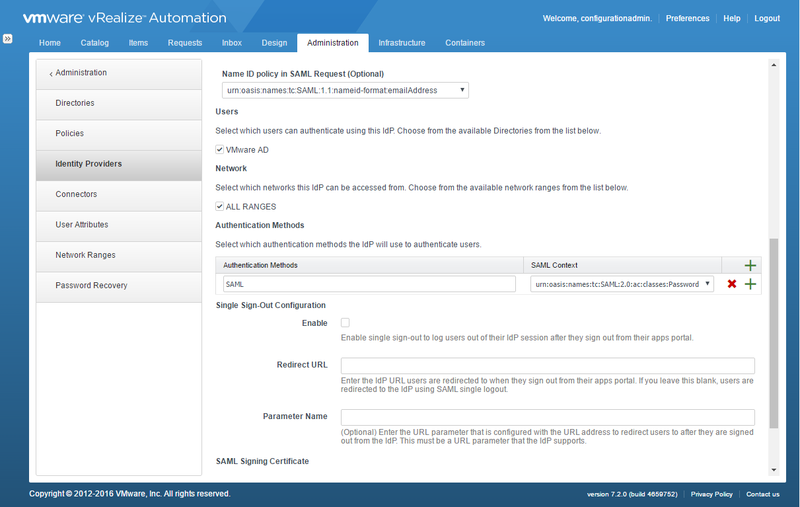 This section covers how to register the vRealize Automation Client for Single-Sign-On. 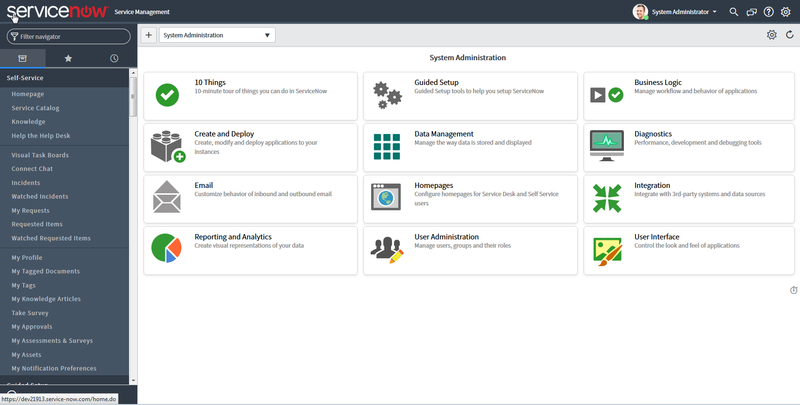 Select the Integration vRealize Automation menu item in ServiceNow. 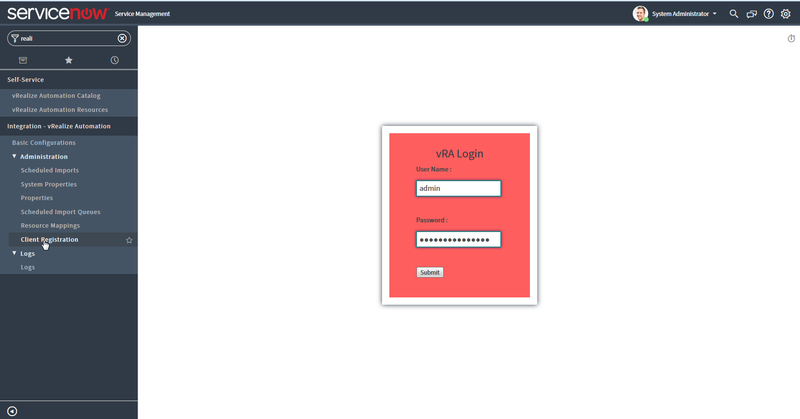 Enter the vRealize Automation client single sign on credentials, such as administrator, admininstrator password from vsphere.local tenant in vRealize Automation, in the first dialog labeled VRA Detail. 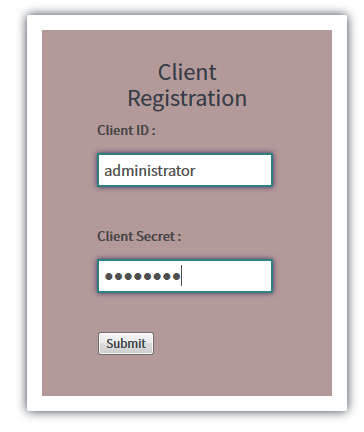 Enter a unique name for your plug-in client in the second dialog, labeled Client Detail. Click Submit and wait until you see the Completed status in the upper menu bar with a green check mark. 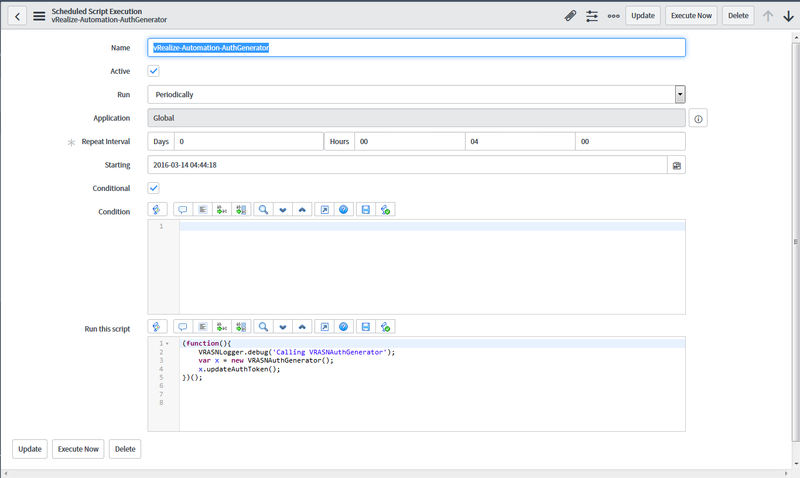 Configure and run scheduled import jobs for the vRealize Automation ServiceNow plug-in. In addition, you must add categories to the catalog. On a first time install of the plugin, you must manually execute scheduled jobs to import the catalog and resources. Though there is a default schedule for running jobs, you should edit the schedule time in each import according to your needs as you execute each job. For example, you might want to import catalog items every 10 minutes for high provisioning use. The plug-in provides scheduled imports with the following functions. 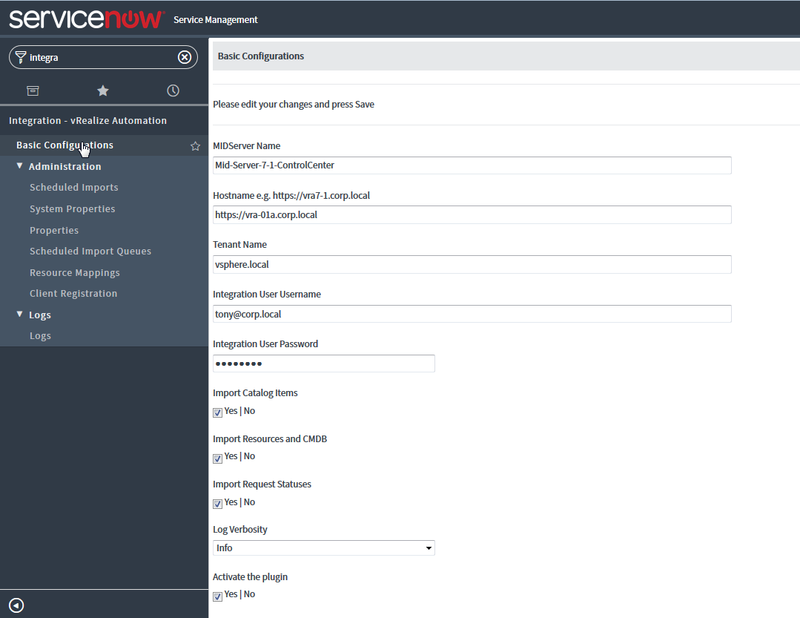 Imports Services from vRealize Automation into ServiceNow as categories. Imports catalog items from vRealize Automation into ServiceNow as catalogs. Imports deployments and machines from vRealize Automation into ServiceNow so that end users can view the resources they own, and so that itil can view them in CMDB as applications and virtual machine instances. Imports request statuses from vRealize Automation requests into requested items. Deletes the scheduled import queues that are older than the interval specified. This section covers how to configure and run scheduled import jobs. Configure the polling frequency for the scheduled imports. Log in as the system admin. Click the applicable job name to open the scheduled import. Change the Repeat Interval in Days, Hours, Minutes, and Seconds. For each job, complete the following steps before proceeding to the next job. Click the Scheduled Imports link. 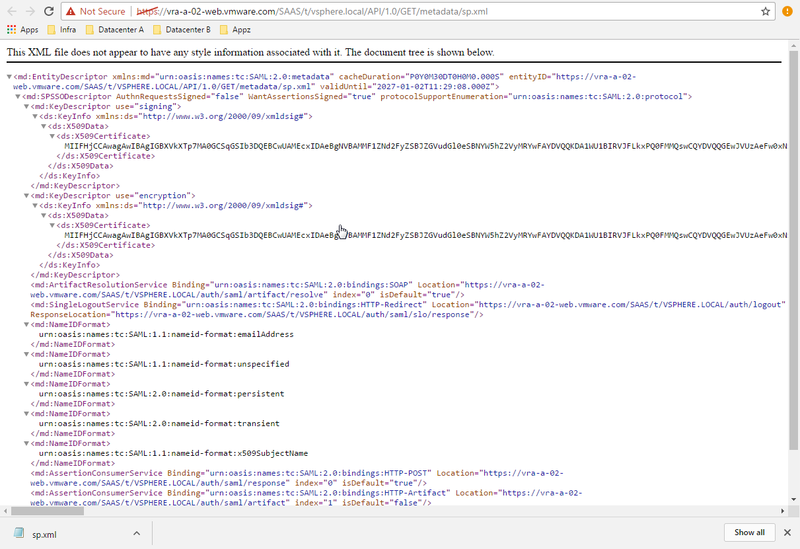 Click the applicable job name to open the scheduled script. Click the Execute Now radio button in the upper right hand corner to run the script. Run the scheduled jobs to import them. Make sure that each job is complete before starting the next one. Completed jobs are shown as "processed" in the Scheduled Import Queue. 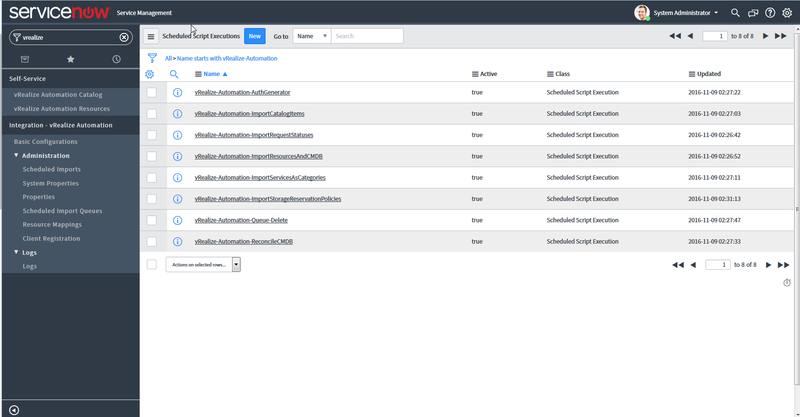 Configure the vRealize Automation Catalog or the Service Catalog to view categories. Choose the catalogs that you want end users to use for provisioning requests. Select the plus sign in upper right corner to add vRealize Automation services, known as categories in ServiceNow, for provisioning. Highlight the categories in the center pane and select Add here. This entry was posted in ITSM Plugin, ServiceNow, VMware, vRA and tagged catalog, cmdb, integration, itsm, plugin, servicenow, SKKB1039, snow, vmware, vra, vrealize automation. Bookmark the permalink.